Serving Pink Lemonade: Wild Orange--and a Giveaway! Essential oils seem to be emerging out of obscurity these days. Years ago my mom introduced them to me but I've been hesitant to share my knowledge with others for fear that they'd think I was crazy! But lately I hear of more and more people "discovering" them and finding out how amazing they are. Have you been wondering what all the excitement is about? Today my friend, Janine, is going to give you a little glimpse into essential oils. If I look at the ingredients in Lysol Antibacterial spray, I can't say them, let alone spell them. And I most certainly do not know what they are! I used to spray them all over my counter. Then make sandwiches on the same counter. Ugh! What on earth did we ingest? Here is an all natural cleaning tip: Wild Orange essential oil is a cleaning powerhouse! I put it in a spray bottle with water and use it to sanitize my counters. That same spray can be used to spritz the surfaces of your home instead of Lysol to kill pathogens without introducing synthetic chemicals in their place. Ingredients: Water, DoTERRA Wild Orange. Hey, I know those words. Wash the counter and break out the PBJ! Add it to a spray bottle of water and spritz the surfaces of your home instead of Lysol to kill pathogens without adding harmful, synthetic chemicals to your home. Wild orange is great as an antibacterial soap without harsh chemicals that dry out your skin or add toxins to your body. 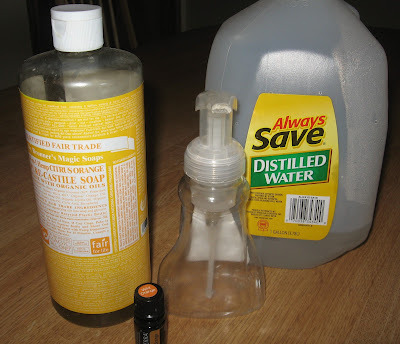 Using and empty foaming soap dispenser, fill it up 1/4 full with liquid castile soap like Dr.Bronner's. I used the citrus flavor here, then fill the rest of the way with distilled water. (chlorine in your tap water can dry out your skin). Finally, add 7-10 drops of wild orange. Wash away! For more wonderful uses for doTERRA wild orange, please visit my blog. Anyone that contacts Janine through her blog and mentions Serving Pink Lemonade will get 25% off the doTERRA intro kit! The offer is only good through March 15th. Learned how to make coconut lime body scrub from your blog. Orange oil can help prevent infection in a cut. Love the lemon brownies recipe! Oh my, I saw the lemon brownies too. Now I have to make them -- off to the market! Wow! Everything at MLIF looks awesome! I really want to try making orange vinegar now. Good thing it's orange season!! Love green cleaning & am excited to find DoTerra! I think it would smell fabulous! I learned how to make Orange Hot Cocoa! Yum! Interesting it can be used for minor cuts and scrapes. Wow, I found out a lot about essential oils. I like the idea of green cleaning and natural products. Thanks. That it can do the same things as Lysol! Amazing~! How exciting! I love that you're doing this giveaway! I love learning about all of these oils. This is all new to me and I look forward to discovering all the many things it can do. Peppermint for fevers?!? Who knew. That essential oil key chain is amazing!